Published in the South Kent Gazette, 2 May 1979. THE WALLS, VARIOUS GATES, MYTHICAL ROMAN GATES, TOWERS AND NEIGHBOURING STREETS. Historians have held diverse views as to where the walls of Dover were, who built them, and when they were built. The Rev. John Lyon did not accept the tradition that the Romans built walls and gates round Dover, and says that "it was not until towards the close of the reign of William I that Dover was defended with a wall, gates, and towers, and some of their foundations were laid with Caen stone from Normandy.“ Going further, the Rev. S. P. H. Statham is of the opinion that there were no town walls until about the year 1310. Other writers inclined to the Roman theory, such as publisher and historian Mr. W. Batcheller and the Rev. P. A. Glover. The latter was Rector of Charlton in 1840, and went to a great deal of trouble to dig for foundations, and, in conjunction with Mr. Batcheller, left a clear and reasonable account of where the town walls were. There is no definite evidence that the Romans built any portion of the walls of Dover, but there is pretty clear evidence that they did not build the gates that bore the names of their Emperors Severus and Adrian. 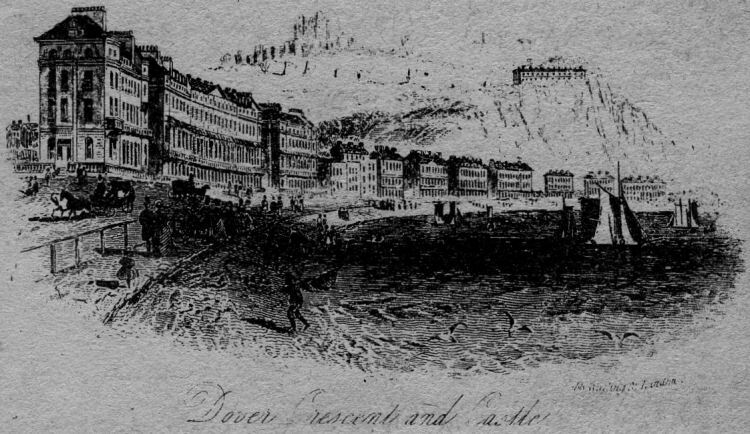 During the Roman occupation of Dover, the place where Severus Gate stood was covered by the sea. As to Adrian Gate, it is a well established fact that it was built at the same time as Snar Gate, in 1370. It is also to be noted that the two gates bearing the Roman names of Severus and Adrian, in old documents were called Boldware and Upwall Gates; and in every way the weight of evidence is to the effect that these Roman names are a comparatively modern innovation. It is stated by the Rev. Wm. Darell (chaplain to the Queen) in his History of Dover Castle, written in the reign of Queen Elizabeth, that Withred, (Darell spells It so. The Saxon way was Wihtred. pronounced very much like Widred, the name given to a road In Dover.) King of Kent, commenced the walls of Dover about the year 700 A.D.
After the most salient point was protected—from the river up to the Castle Cliff—then, in course of time, it must have occurred to someone, responsible for the safety of Dover, that there was a danger of marauding parties landing on the western shore, near Archcliffe, and marching over the Western Heights, to attack the town on the land side; therefore the circuit of the wall was completed most probably early in the Norman period. 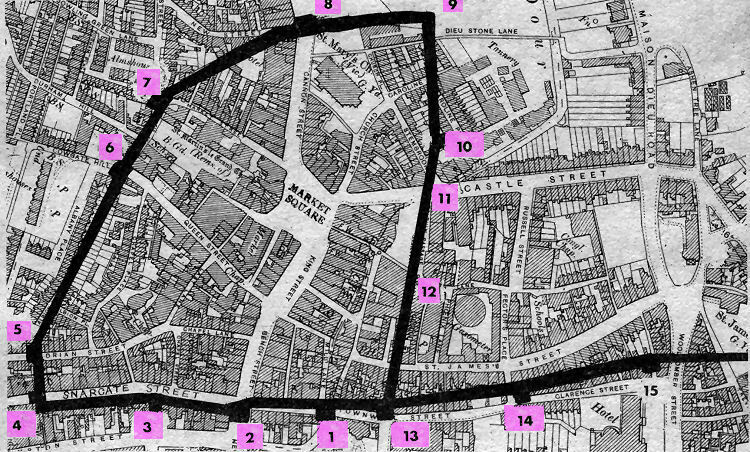 The walls, gates and towers superimposed on a street map of the early 1900s. Dismissing the question as to when the walls were built, we may now trace them as they are shown by the black line on the plan. Following the route adopted by the old writers who believed in the Roman walls, we will start at Butchery Gate (1). This gate, also called Standfast Tower, stood on the southern side of Townwall Street, opposite the old Town Mill (which stood midway between what is now the "Holiday Inn" and Bench Street), the river passing under this gate to the sea. This arrangement must have been of the Middle Ages. Originally, the river flowed direct into the Bay, and would have been too wide at its mouth for gates or walls to span it. Later, the stream was divided; one part, known as West Brook, keeping its present course, and the other, called East Brook, entered the ancient harbour under the Castle Cliff. Still later, the stream was again united, and entered the sea under Butchery Gate. The name of this gate arose from the fact that the butchers’ quarter was there. This gate was taken down in 1819. Severus Gate (2) was at New Bridge, ascribed by Kilburne to the Emperor Severus, A.D. 209, but most probably built much later. Here was the office of the King’s Customer, and “The Bench,“ a meeting place Of merchants. The gate house was removed in 1762. Old Snar, Gate (3) was a tower in the Wellington Passage, opposite the old Dover Express printing works in Snargate Street (which were demolished to make way for the York Street dual carriageway). That was the original Snar Gate, for the name Snargate appears in town deeds before the gate lower down the street was built. By a shorter route than the later one, the wall was continued from there up to Cow Gate. Snar Gate (4). This gate was built in 1370, when the recession of the sea made it desirable to extend the wall in that direction. By further retreat of the sea and the formation of the Pier District, that gate became unnecessary, and was taken down in 1683. 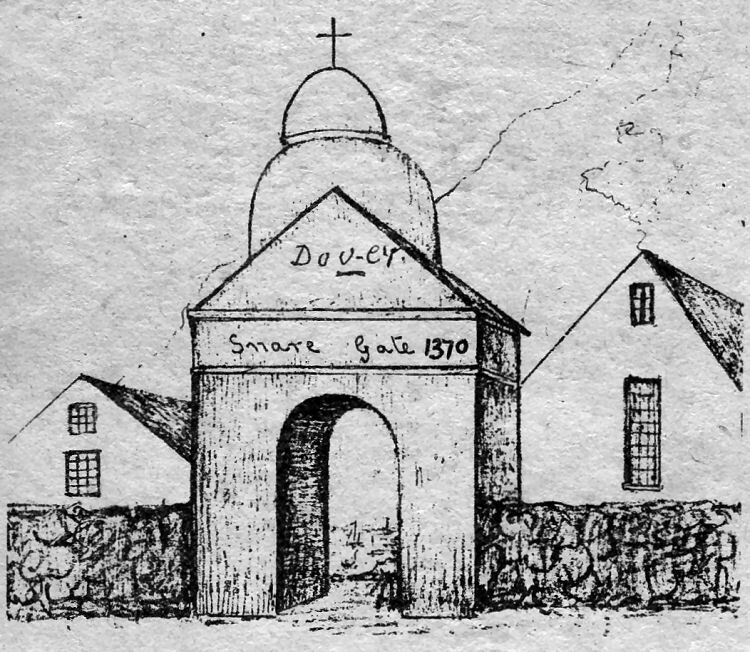 A sketch of the old Snare Gate — topped by a cross — probably based on an old painting and. From thence, the new wall, appropriately called "Upwall,“ went up the face of the cliff. Immediately above was Adrian Gate (5). Whether this gate existed before the extension of the wall down Snargate Street about the year 1370 is not known, but being called Upwall Gate it probably took its name from the wall running up the cliff, and no mention is made of this gate in Dover records until the reign of Elizabeth. From this point the wall slanted along Chapel Place to Cow Gate (6), at the top of Queen Street. This gate was removed in 1776. From thence the wall continued to St. Martin’s, or Monk’s Gate (7), which was a small postern in the western boundary of the precincts of the church of St. Martin-le-Grand, and from thence the wall crossed Market Street, flanked New Street, and on to Biggin Gate (8). This gate was taken down in 1762, and part of the wall near there was demolished in 1827. From this point the wall was continued down the northern boundary of St. Mary’s Churchyard, and 183ft. further eastward, whence it turned at a right angle across Dieu Stone Lane. There was a tower at the angle of the wall (name unknown) (9), from whence the wall proceeded to Stem-brook, where there was another tower, called “Tinker’s“ (10), and just where the wall passed across the land now Castle Street (11) the River Dour ran under the wall. From thence the wall proceeded direct to Dolphin Lane (12), where the foundations of a gate were found, about 180ft. from Dolphin Lane Bridge. This gate formed the ancient entrance to the town on that side, Dolphin Lane having been an important thoroughfare in the olden times. From Dolphin Lane the wall crossed St. James’s Street (which appears to have not been then in existence), joining the wall up the seashore at Fisher’s Gate (13).